According to the report, everyone is exposed to two types of EMFs: (1) extremely low frequency electromagnetic fields (ELF) from, for example, electrical and electronic appliances and power lines and (2) radio frequency radiation (RF) from wireless devices such as cell phones and cordless phones, cellular antennas and towers, and broadcast transmission towers. Other sources of exposure include, electrical wiring, wireless handheld devices, cell towers, “smart meters”, Wi-Fi, wireless laptops, wireless routers, baby monitors and other electronic devices. Health topics include damage to DNA and genes, effects on memory, learning, behaviour, attention, sleep disruption, cancer and neurological diseases like Alzheimer’s disease. There appear to be risks for each of this from continued exposure. On May 11, 2015, 190 scientists from 39 countries submitted an “International EMF Scientist Appeal” to His Excellency Ban Ki-moon, Secretary-General of the United Nations. These scientists have collectively published over 2,000 peer-reviewed papers on the biological and health effects of radiations. “We are scientists and engineers, and I am here to tell you – we have created something that is harming us, and it is getting out of control! Putting it bluntly, they are damaging the living cells in our bodies and killing many of us prematurely” says Dr. Martin Blank, heading the committee of Scientists and from the Department of Physiology and Cellular Biophysics at Columbia University, USA. In July 2010, a previously unrecognized collection of nearly 5000 studies linking low-level wireless signals to bioeffects was discovered by noted scientist, Magda Havas, PhD of Trent University in Ontario, Canada. More than 2300 of these studies, concerned with radio-frequency and microwave radiation, were compiled by Dr. Zorach Glaser, PhD, an officer in the US Navy at the request of the Naval Medical Research Institute. Many of these studies were previously classified and others originated in Eastern Block nations such as the USSR, Poland and Czechoslovakia and have only recently been translated. Here is a sampling from Dr. Glaser’s report on the 122 biological phenomena (effects) and clinical manifestations attributed to microwave and radio-frequency radiation. In May 2011, WHO / International Agency for Research on Cancer (IARC) has classified radiofrequency electromagnetic fields as possibly carcinogenic to humans (Group 2B), based on an increased risk for glioma, a malignant type of brain cancer associated with wireless phone use. The same category as lead, DDT, chloroform & methylmercury. Goldenwave does work with Dr, PHD, and top scientists worldwide in order to demonstrate the protective biological, energetic & clinical benefits of our technologies related to EMF/EMR/Dirty electricity exposure. This is ongoing and here is a list of some of what we are either currently testing or wish to test. 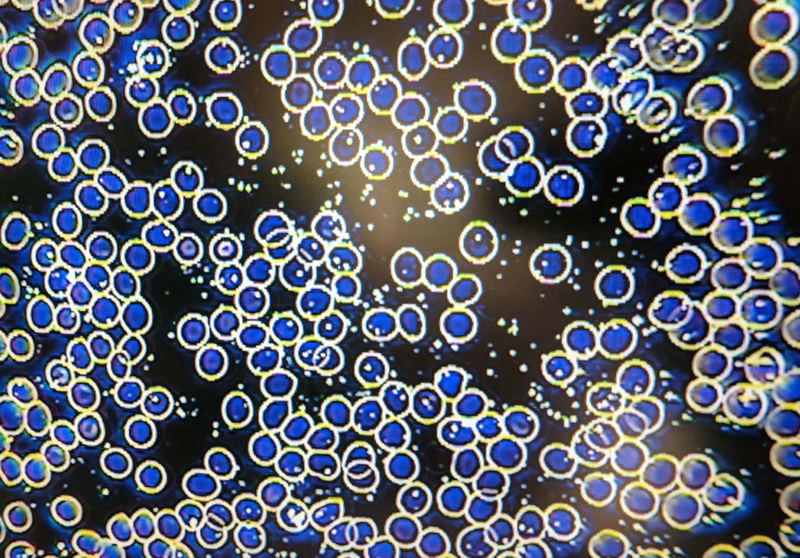 Here is a live blood cell analysis using a Darkfield Microscope , that looks at the blood cells of a test subject. First, we drew a baseline sample from our subject (Photo 1) in the morning without meal and no strong EMF exposure. Followed is a sample (Photos 2 & 3) after the subject had been directly exposed to a very strong WiFi router for 15 minutes at a consistent 45V/m emission. We gave a short 20 minute recovery, however we found it was actually getting worse at that time because EMF affects our blood for hours after exposure. We then decided to directly expose the subject again to the same Wi-Fi router (this time GoldenWave-equipped) and he also wore a GoldenWave wristband for 20 minutes. We drew a sample afterward (Photo 4). In the baseline sample, the blood cells are relatively healthy and vibrant. The blood cells are strongly clumped together. The blood cells shows very strong agglomeration. GoldenWave technology reverted in the short time the harmful effects on Blood cells and made the overall blood look better than baseline. We noticed it was the only time the immune White Blood cells showed activities as well. “Electromagnetic pollution may be the most significant form of pollution human activity has produced in this [20th] century.” http://www.drweil.com/drw/u/id/QAA26193. The overall problem with environmental electromagnetism is much deeper, not only of concern at power line frequencies, but also in the radiofrequency range encompassing mobile phones. Here the public’s continuing exposure to electromagnetic radiation is largely connected to money. Indeed the tens of billions of dollars in sales one finds in the cell phone industry makes it mandatory to corporate leaders that they deny, in knee-jerk fashion, any indication of hazard. “We are compelled to confirm the existence of non-thermal effects of electromagnetic fields on living matter, which seem to occur at every level of investigation from molecular to epidemiological. “Claims that cell phones pose no health hazards are supported solely by Specific Absorption Rate (SAR) limits safety standards written by the telecommunications industry decades ago based on studies they funded. These have made the erroneous assumption that the only harm that could come from cell phone radiofrequency emissions would be from a thermal or heating action, since such non thermal fields can have no biological effects. The late Dr. Ross Adey disproved this three decades ago by demonstrating that very similar radiofrequency fields with certain carrier and modulation frequencies that had insufficient energy to produce any heating could cause the release of calcium ions from cells. Since then, numerous research reports have confirmed that non thermal fields from cell phones, tower transmitters, power lines, and other man made sources can significantly affect various tissues and physiologic functions. also being promoted for 6 to 8-year-olds. It is not generally appreciated that there is a cumulative effect and that talking on a cell phone for just an hour a day for ten years can add up to 10,000 watts of radiation. That’s ten times more than from putting your head in a microwave oven. Pregnant women may also be at increased risk based on a study showing that children born to mothers who used a cell phone just two or three times a day during pregnancy showed a dramatic increase in hyperactivity and other behavioral and emotional problems. And for the 30% of children who had also used a cell phone by age 7, the incidence of behavioral problems was 80% higher! Official comments to the FCC on guidelines for evaluation of electromagnetic effects of radio frequency radiation, FCC Docket ET 93-62, November 9, 1993. 1993: Food and Drug Administration (FDA): “FCC rules do not address the issue of long-term, chronic exposure to RF fields.” Comments of the FDA to the FCC, November 10, 1993. Comments of NIOSH to the FCC, January 11, 1994. 1994: Amateur Radio Relay League Bio-Effects Committee: “The FCC’s standard does not protect against non-thermal effects.” Comments of the ARRL Bio-Effects Committee to the FCC, January 7, 1994. May 27, 2011: Council of Europe passes a resolution recommending wired Internet connections in schools, and the creation of radiation-free zones to protect electrosensitive people. http://assembly.coe.int/Documents/AdoptedText/ta11/eRES1815.htm. August 30, 2011: The Israeli Ministry of Education publishes guidelines strictly limiting the use of mobile phones on all school grounds, citing children’s and youths’ increased risk of malignant tumors and the “passive exposure” experienced by children who do not use phones. March, 2012: the Austrian Medical Association (ÖAK) releases guidelines for the diagnosis and treatment of health problems caused by exposure to electromagnetic fields. June 19, 2012: The Russian National Committee on Non-Ionizing Radiation Protection has officially recommended that WiFi not be used in schools. http://youtu.be/5CemiJ-yIA4. 20 April 2016: City of Haifa, Israel bans WiFi in schools. WiFi is ordered immediately removed from all kindergartens and schools in the city to protect the children from radiation. A wired internet system is being installed in all schools. We respect your privacy & will not share your email.